CIPS surveys, widely used in the corrosion control industry, are marketed as a method of monitoring the corrosion status of the pipeline. Exagerated claims are made for this type of survey This type of survey is widely used in the corrosion control industry but is oversold with exagerated claims. Pipeline owners should not engage this type of survey without understanding what they will get for their money. At present this will be a mass of data, a load of graphs and some very vague opinions on a variety of conflicting theories based on psuedo science that can be disproved in minutes. Pipeline operating engineers should understand the complete specifications of work and be able to analyse the data and demand that the report be a clear description of the findings and recommendations for consequent actions. The report should be in language that can be understood by ordinary people and especially by the operatives who carry out the survey, the landowners of the pipeline wayleave and any financial advisors, shareholders and decision makers. It must also be understandable by the public who are likely to be impacted by any failure of the pipeline. At this time CIPS surveys are marketed as a method of monitoring the corrosion status of the pipeline and this is simply untrue. It is also implied that they can gage the effectiveness of the cathodic protection systems and this is also untrue. However, CIPS can be enhanced by techniques that have been developed over the past 30 years and that are now defined in the Cathodic Protection Network suite of procedures. 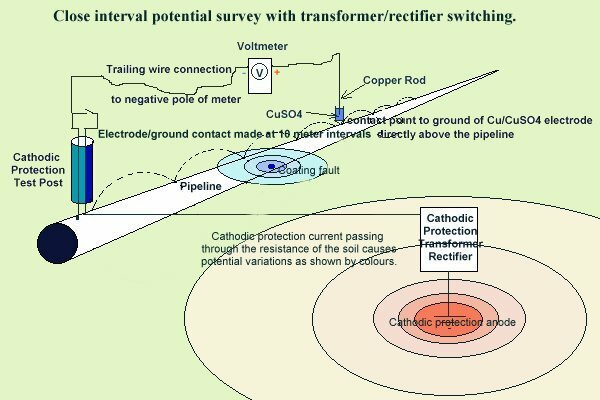 These procedures can show the exact location of coating faults and if the cathodic protection system is stopping corrosion at these points. The owner, operator and engineer in charge can see corrosion, and watch it being controlled. In fact, this can all be remotely monitored and corrosion itself can automatically controlled. This cannot be achieved by the established understanding of cathodic protection and for this reason it is in the interest of the pipeline, oil and energy industries that this web page is understood. All pipelines, railways, power cables and other electrically conductive paths form an integrated electronic circuit that is recognised by the existance of committees and working groups in all countries. The CIPS type of survey is gathering electrical data about part of this circuit and pipeline owners need to be aware that corrosion leaks can be shown to be caused by sunspot activity and other external influences known as stray currents. However, leaks are more commonly caused by inbalance in the cathodic protection systems in the area because of misunderstanding and lack of co-operation. CIPS surveys must be co-operative or they are a waste of time, effort and money. If the work is to be carried out on competitive tender (NOT RECOMMENDED) then all those competing should view the whole of the pipeline from all ground access points before submitting their proposals. On award of the work, the survey team leader must conduct an overview of the complete pipeline to be surveyed and produce a report with observations and requests for additional permissions for the work to be carried out in safety and security. The team leader and client representative engineer/consultant must review all previous survey data cathodic protection records and 'as built construction drawings and photographs. The following was published many years ago when analogue recording voltmeters had to be used as data loggers were not available. Reel of trailing conductor and spool. 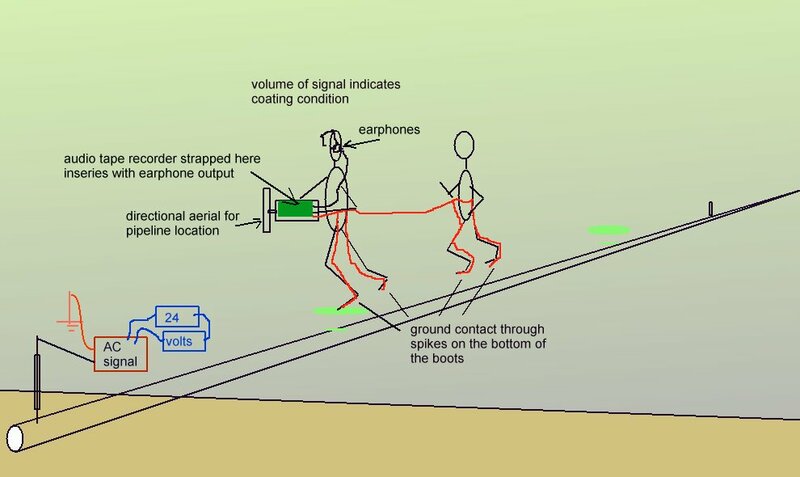 6.1.2 Connect the walking electrodes to the trailing conductor on the carrying spool. 6.1.3. Connect the other end of the trailing conductor to the positive terminal of Channel 4 on the recording voltmeter. 6.1.4. Connect the negative pole of Channel 4 of the recording voltmeter to the pipeline test facility. 6.1.5. The timers should be switching the CP current off for a period of 3 seconds and back on for a period of 12 seconds. 6.1.6 Set the chart speed at 1000mm/hr and start recording. 6.2.1. 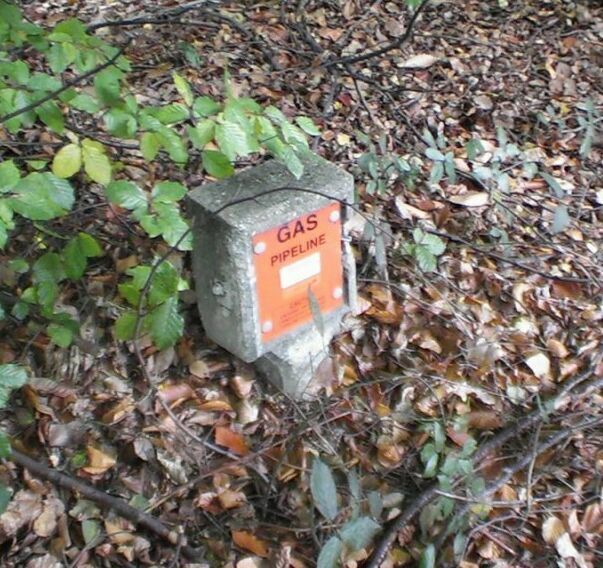 Lift both electrodes clear of the ground for a period of a minute, to leave a clear trace of the start of the survey, and make a note on the chart "Location, start continuous overline survey." 6.2.2. Leave an attendant watching the recorder, and 'walk' the two electrodes, at one meter steps, over the pipeline to the next CP test facility. 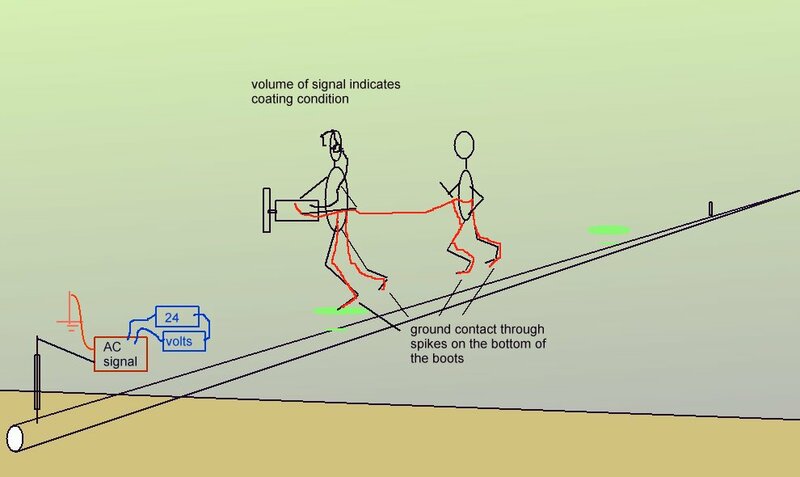 Each step should take about one second and ground contact must be maintained by either electrode, or downward spikes will appear on the chart trace. 6.2.3. 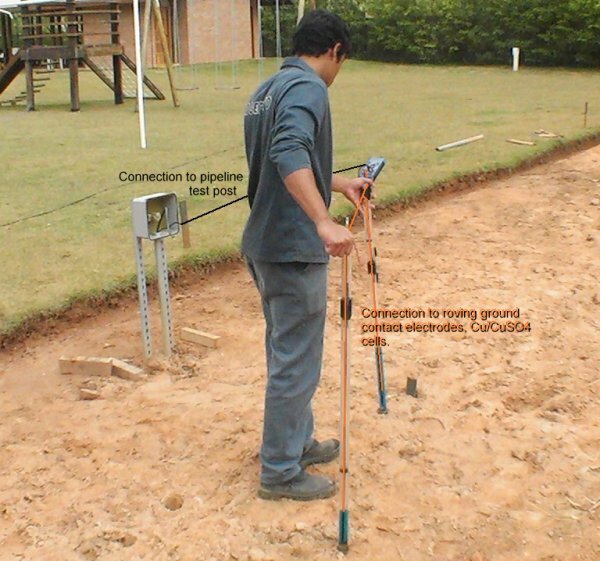 At the next test facility, lift both electrodes clear of the ground for one minute to leave a clear trace on the chart, then place them together on the ground. 6.2.4. 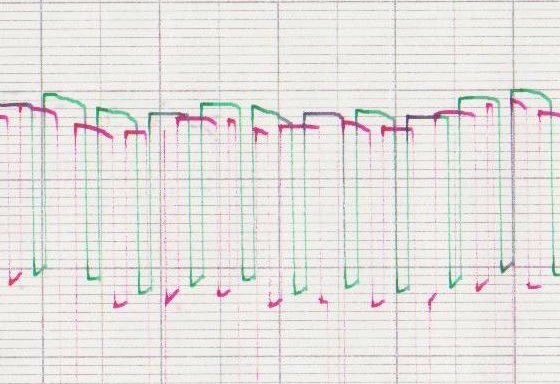 Mark the chart with the location, so that the section of the trace can be clearly identified. 6.2.5. Lift both roving half-cells clear of the ground again, mark the chart and survey to the next test facility. 6.2.6. 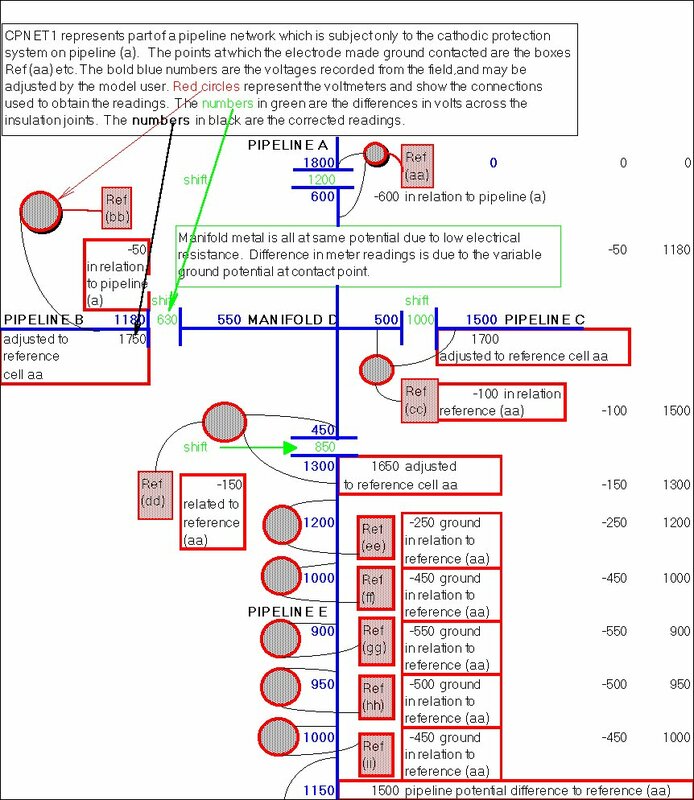 Repeat for the complete length of a section of pipeline between isolation joints. If there is a risk of the conductor being broken, such as at road crossings, then the chart recorder should be moved to a new, suitable location. 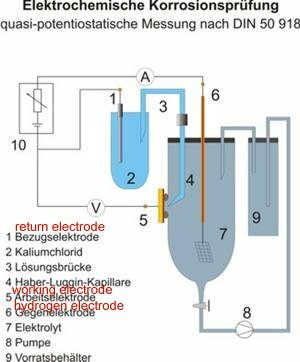 Where this is necessary, then the new remote reference electrode potential should be related to the last remote reference electrode. 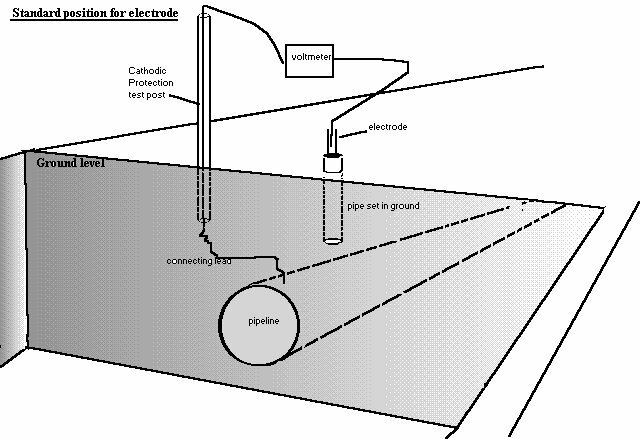 The chart will bear a trace of the voltage between the old remote reference electrode and the fixed electrode over the pipeline at the beginning of the preceding survey run. The new position of the remote reference electrode can be established in relation to the last position of the over the pipeline polarized potential survey. 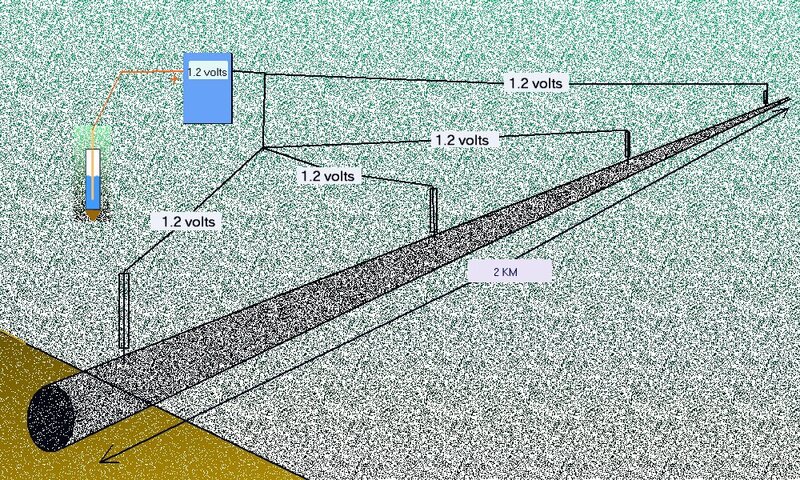 It is therefore possible to have a complete section of pipeline with a common reference electrode potential. The trace will appear as a 'saw tooth', which will undulate along the section surveyed. The on and off readings will normally run parallel, except where passing through the immediate area of influence of the groundbed which is being switched. Any other marked peaks where the on and off readings run parallel, are due to IR influences in the ground, and can indicate interference. 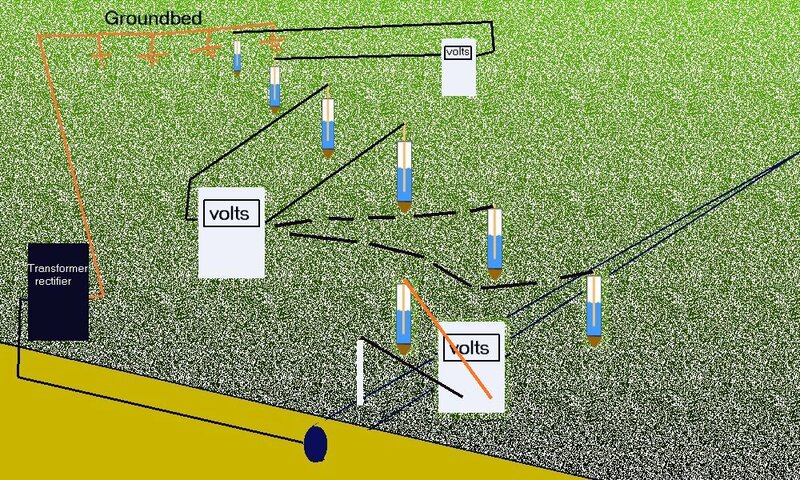 Troughs can indicate coating faults, shielding or interference and their location should be identified and marked on site . Where the 'off' potential is less than 0.850v (the trace being negative to the top), then investigations should continue at this location. Each location that is investigated should be identified and have its own file. When all instrument techniques have been carried out, the indications should be checked by excavation and physical examination of the pipe and coating condition. 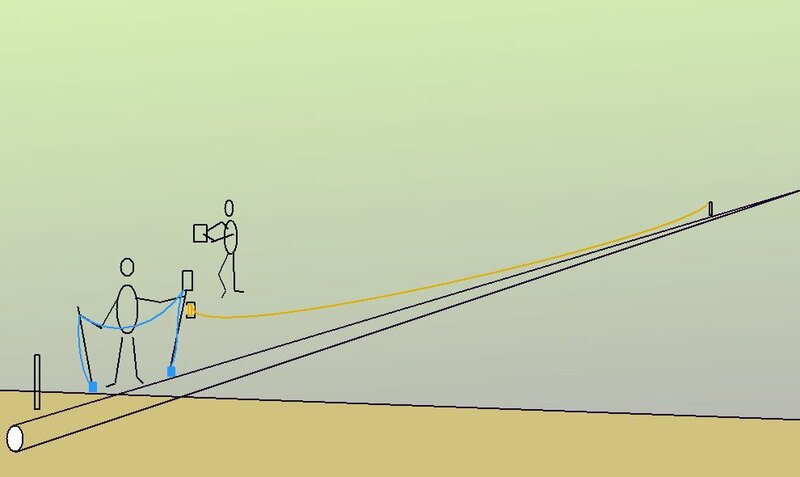 The location and work should be photographed, or video recorded to provide training material and allow techniques to be developed further. 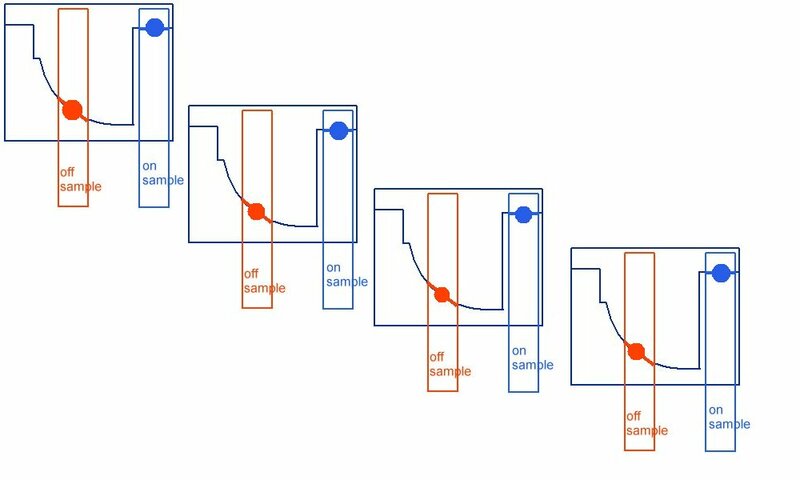 The development of Close Interval Potential Surveys. This type of survey provides much useful information as well as removing some of the errors in traditional pipe-to-soil voltage readings. 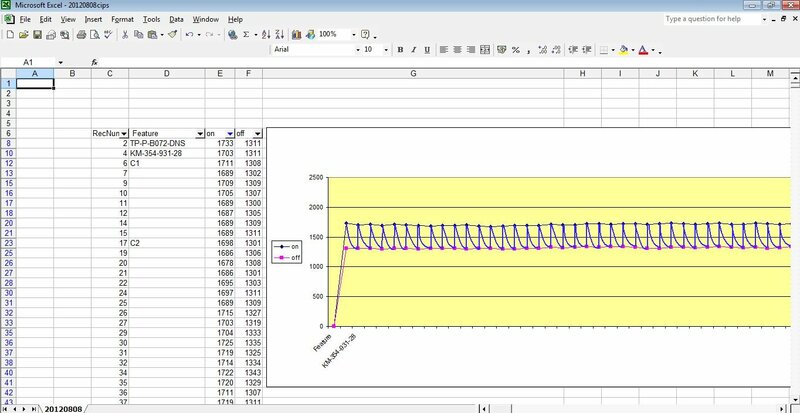 An arrangement of two roving half-cells on a trailing conductor, allows a continuous trace to be made on a recording voltmeter or data-logging device. 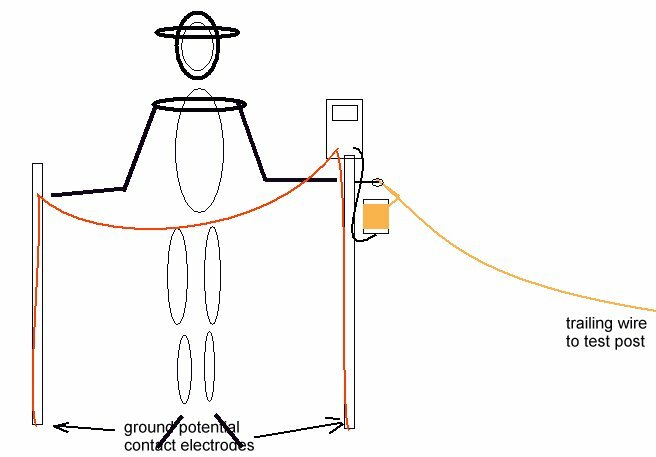 During the four year period of the development of CIPS there were only digital voltmeters available and we used these with someone writing the voltages on a clipboard as seen in the sketch below. 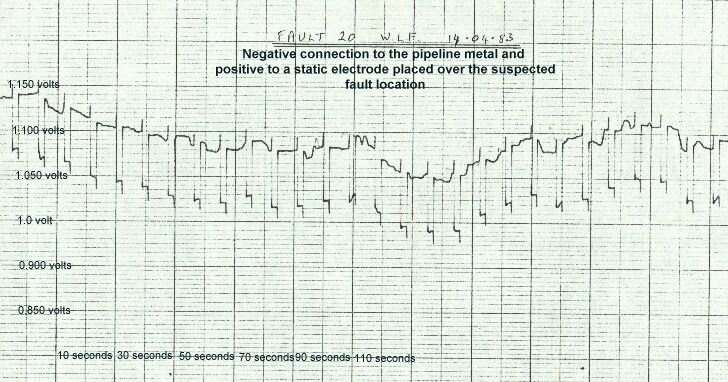 We used a Pearson type instrument for pipe location and to give a secondary indication of the positions of coating faults. This equipment was supplied with earphones through which the operator judges the volume of the monotone that was impressed into the pipeline at the nearest metalic contact point. In order to make this measurable I strapped a small audio tape recorder to the receiver so that it was in series with the earphones. I developed a system in which I could 'mark the locations' with an audio peak on the tape and later played the tape back through a recording volt meter. At the time these were analogue pen recorders and I was able to use the audio event marks to pin point ground locations. Electronics have improved over the past 30 years but the operating principles of pipeline insruments has hardly moved forward. Pipeline locating equipment is just a variation of the older methods. The above is now called Pipeline Current Mapping shortened to PMC. A CIPS survey still requires a pipe locator to precede the team to mark the exact position of the pipeline. 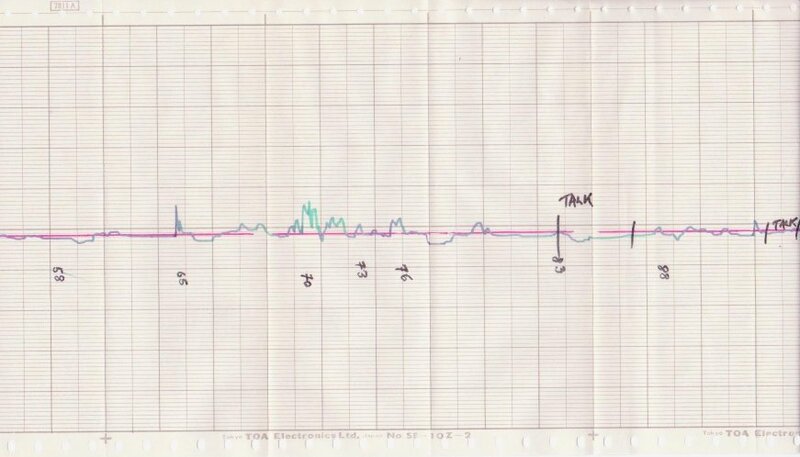 With the CP switching on and off, two graphs used to be plotted from data manually by an assistant. The present procedure is defined later. 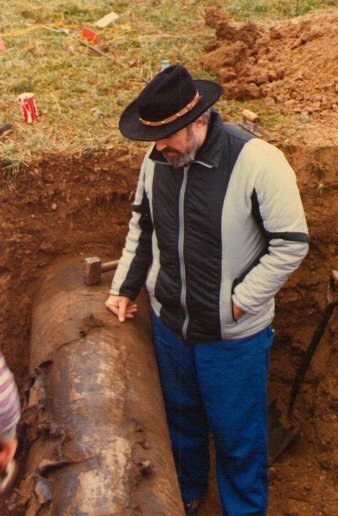 The results require other survey techniques to determine the exact location of coating faults and show where the pipeline is cathodically protected. 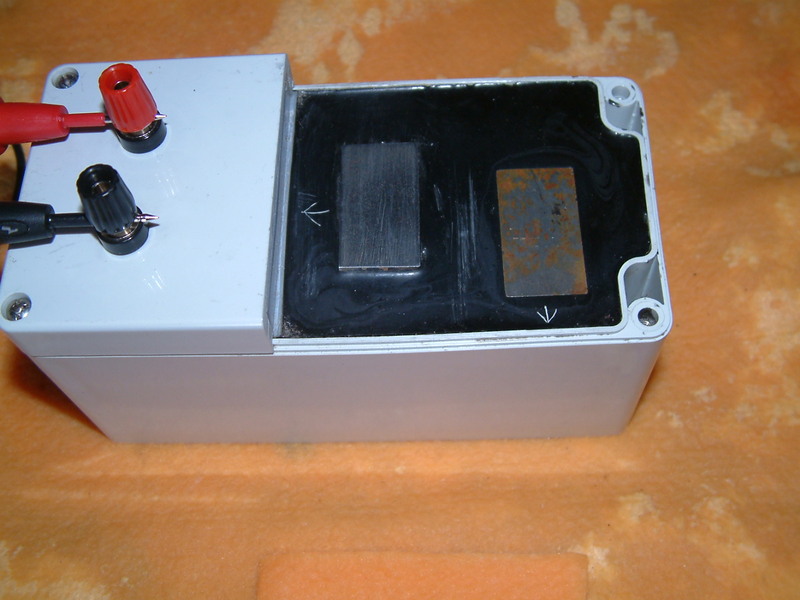 These other techniques must include a method to make a voltage measurement between the anodic interface of a corrosion cell and the electrolyte to which it is reacting. The only method of which I am aware is the Alexander Cell. The instruments that are used in this type of survey are digital recording voltmeters and digital osciloscopes. Digital recording voltmeters can be set up by the operator to measure and record a voltage at set time intervals and this is easily synchronised with any switching device controlling the sources of energy that impress charges into the ground and drain those charges from the pipeline. Digital osciloscopes are controlled by software that gives the operator a set of 'tick box' options. It helps to know how a cathode ray tube osciloscope works to understand that we need to calibrate these instruments according to their use. Electrons are fired at a mirror that is turned by a magnetic field generated by the current of the electrons. The electrons hit treated glass and cause flashes of visible light on the other side of the glass. The user then has to calibrate this series of flashes into a stream that moves across the screen at a level to indicate the voltages that are to be measured. 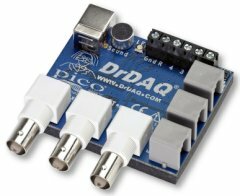 Digital osciloscopes work in a different way but produce a stream of dots that is shown as a continuous line. The dots are seperate voltage measurments... that means that each dot is the potential difference between the two connection sockets into which the probes are plugged. 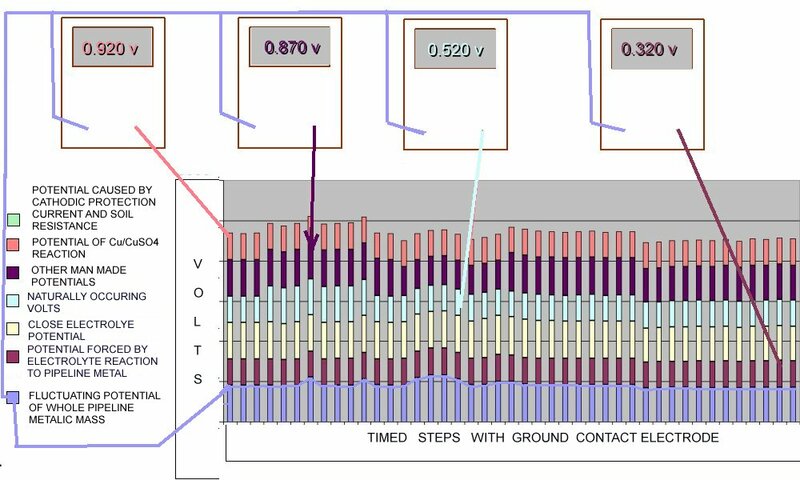 These voltages measurements can be made many thousands of times per second and can be manipulated by the electronic circuitry of the meter. This is controlled by a software program that determins the output to the screen and to a computer. It is essential to understand that all of these meters determine that one connection socket is zero and the other is the variable potential that results in the voltage reading on the display or that is electronicly recorded for later download to a computer. 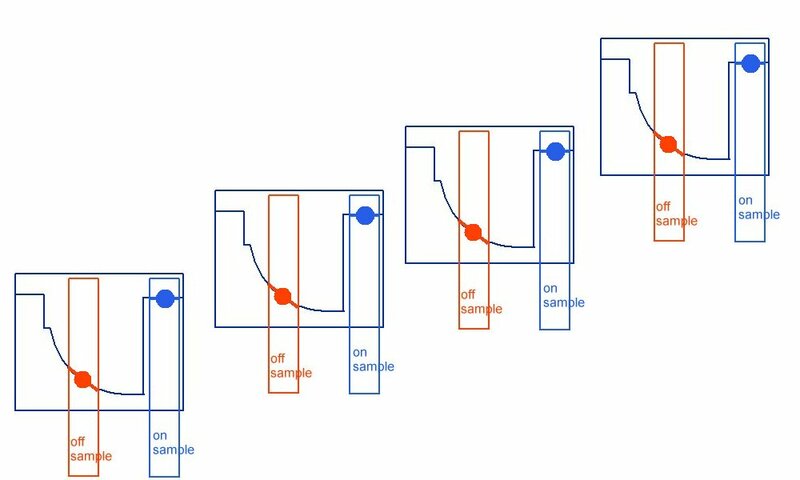 The software records the average of the sample as a 'dot' of data which it positions by pixel location on a bitmap of the screen. This is how all pictures are made in computer graphics and TV pictures. 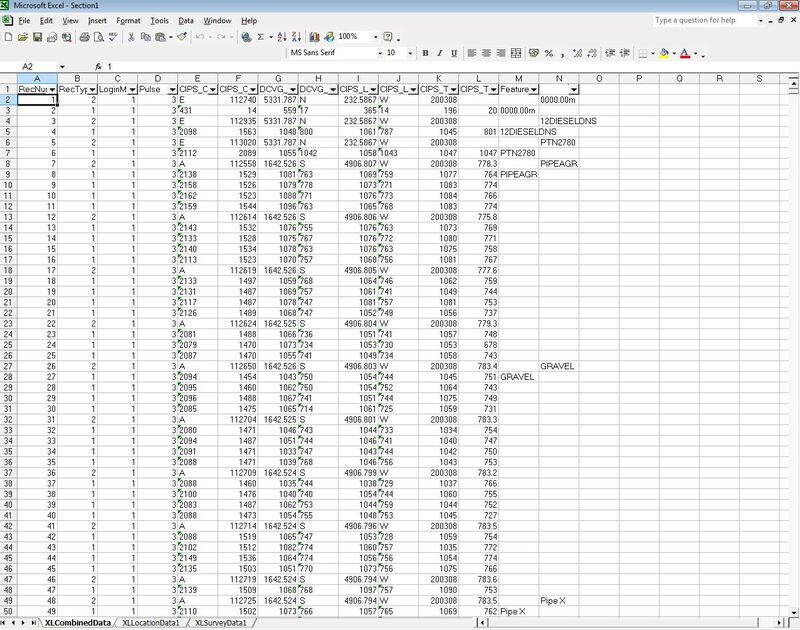 When this data is sent to the computer is is in a conventional format that can be presented on a spreadsheet. This is so that any spreadsheet software can display it in a way that can be understood. 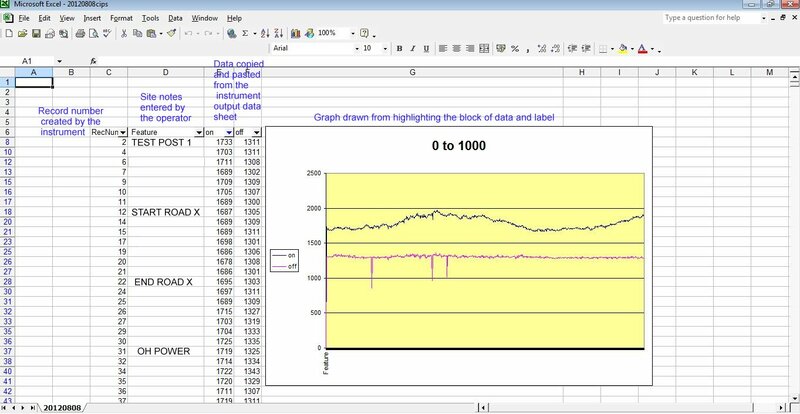 The software in the computer that you use will join the dots that represent the voltages so that you can recognise trends in the variations. THESE ARE NOT WAVEFORMS. The waveforms are shown below and you will note that they resemble the graphs made on the analogue recording voltmeter pen traces. This graph was plotted by an analogue pen recording voltmeter in the early 1980's. 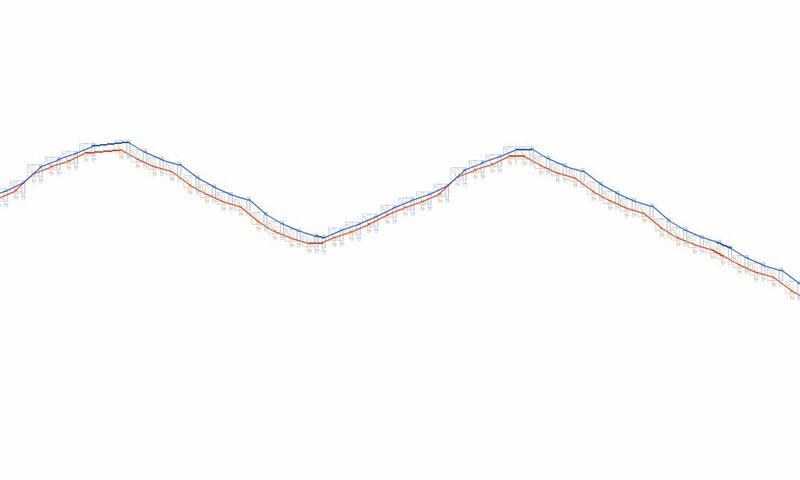 There were no synchronised switching devices available at this time and there was considerable confusion when I presented these graphs to the scientists of the day. There was a great gap in understanding between the academics and the field engineers and between the field engineers and the technicians. WE CANNOT MEASURE A POTENTIAL... EVEN IN A LABORATORY. WE HAVE TO COMPARE ONE POTENTIAL WITH ANOTHER, WHATEVER INSTRUMENT WE USE. A POTENTIAL IS A QUALITY AND SCIENCE THAT MAKES IT CLEAR THAT THERE CANNOT BE A ZERO POTENTIAL. IF ZERO POTENTIAL EXISTED IT WOULD BE A VOID THAT WOULD BE INSTANTLY FILLED. A close interval 'potential' survey should therfore be called a close interval VOLTAGE survey. The data is measured in voltages and these are first viewed on a spread sheet together with information about the exact time and GPS location at which each voltage was measured. 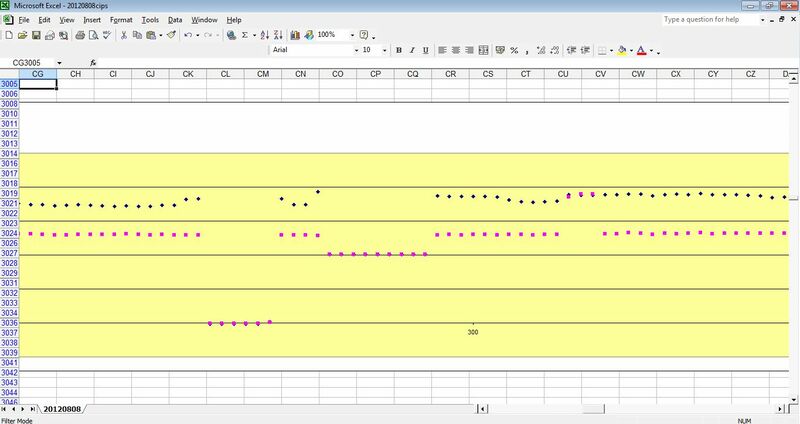 There is a column into which the field operator can write notes and 'function keys' are normally provided to tell the instrument where to place other information and how to treat it within the spread sheet. 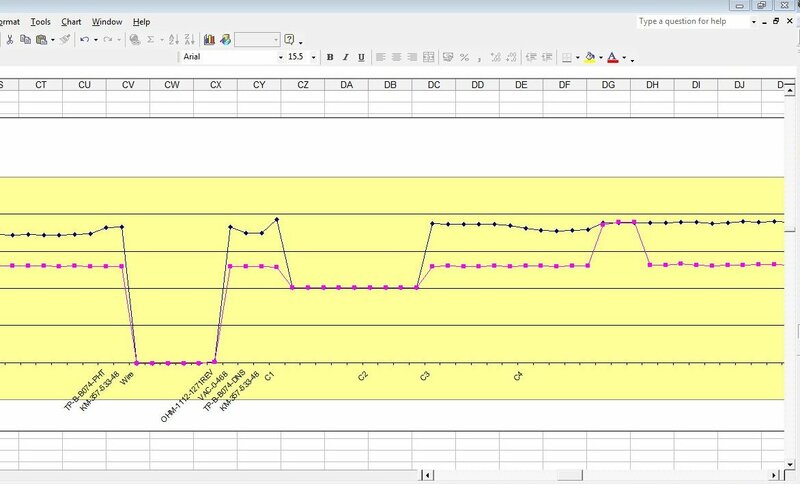 Using spread sheet software we can manipulate the information and data when we have transfered it to a computer. We have to start by selecting the data and information that we need. We the copy this onto a new spread sheet saving the original data in a seperate folder for future reference as the surveys progress. We never destroy original data and must immediately back up folders that contain all information about each pipeline/section/date/time/chainage. 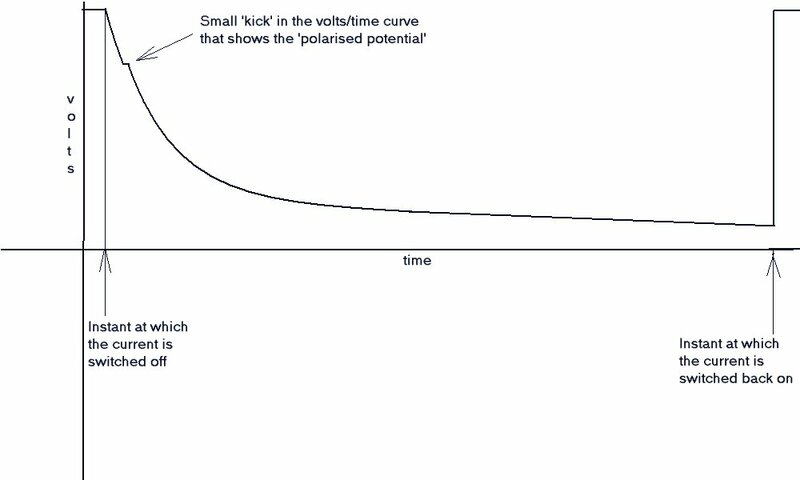 This graph just shows voltages recorded at time intervals and sometimes synchronised through the GPS satelite system to the switching mechanism at the source of the cathodic protection current. 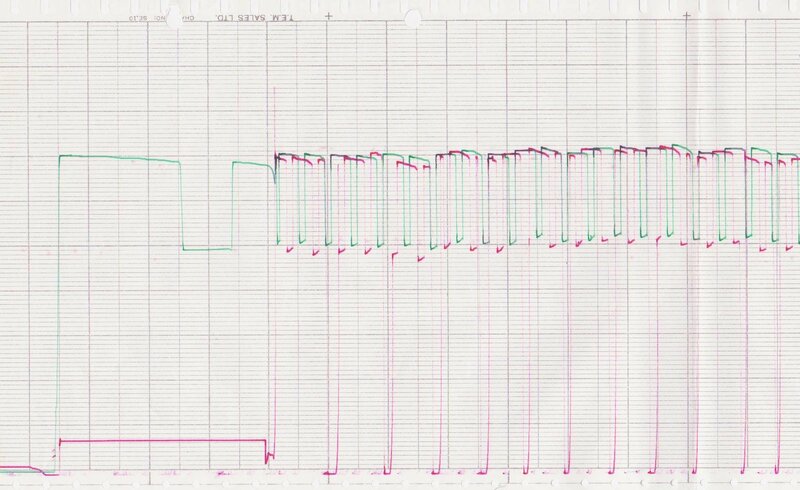 However, we now know that these are individual voltages measured at different phases of the same trace and that the value of the off voltage is entirely dependent on the exact time at which the 'off' sample was made. Each on and each off voltage is represented by a dot on the graph. The single line that really joins the dots would look like this. But the software slices it up and joins the dots like this. and we chose not to see the dots... so this is what we chose to display. 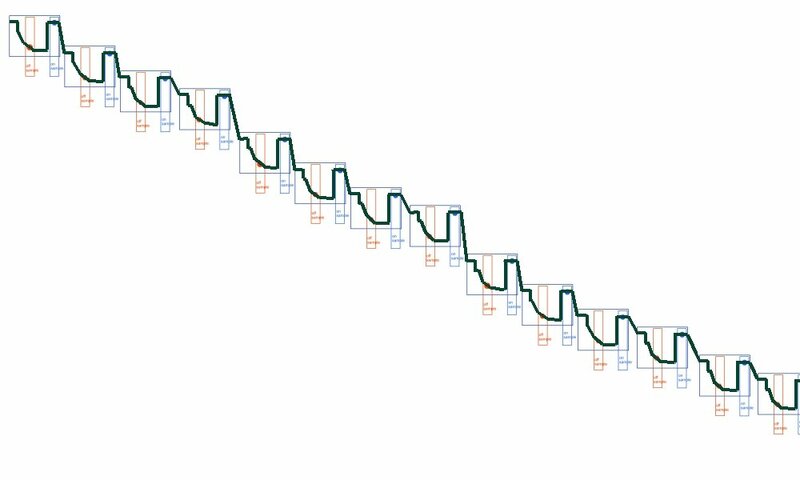 In this process we lose the dots and they represent the real data that is recorded by the instrument. 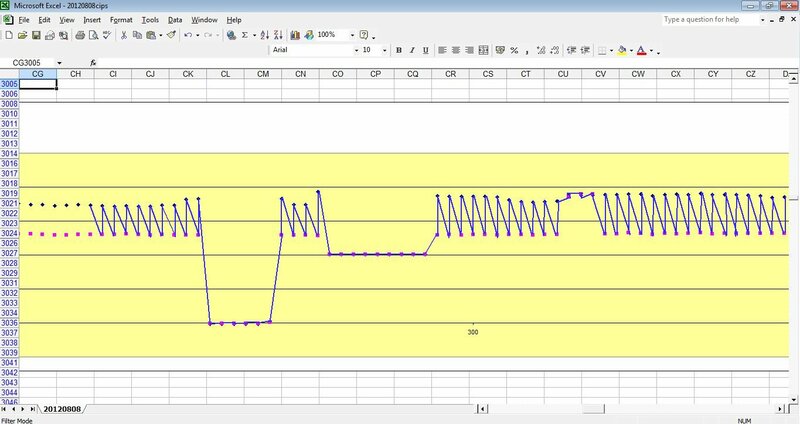 The graph below looks like a waveform which it is NOT ... it is a series of dots indicating a trend in the variation of voltages. The dots have been joined in a misleading manner to look like a line. 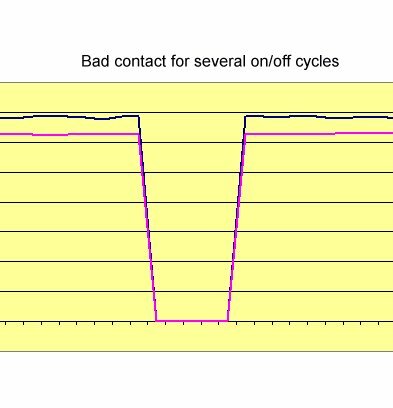 The top trace shows the potential difference between the whole of the pipeline and the ground at each point of contact while the impressed current is switched on. 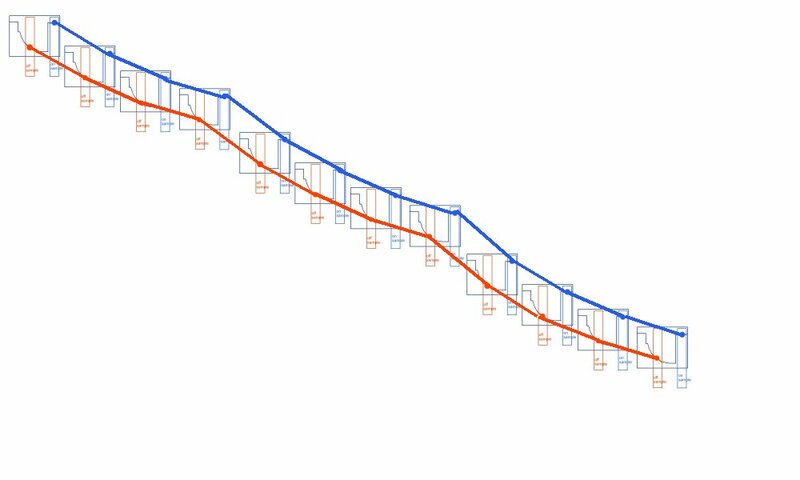 The bottom trace shows the similar potential differences when the impressed current is switched off and is losing it's influence on the total equillibrium between the ground (at that point of contact) and the whole of the pipeline with all it's coating faults. However, there is a natural capacitance in the whole system that causes the downward slope from on to off to be indefinable. The result can be best shown using the column charts below. 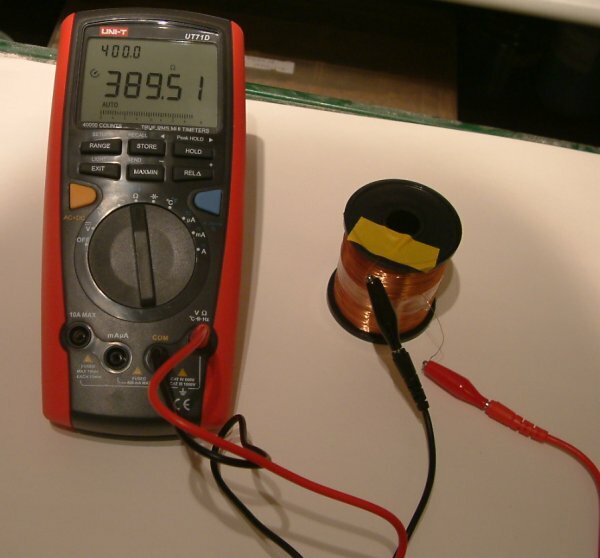 The voltages that we measure are the total of the potentials in the measuring circuit. They are in series so it is easy to visualise and to show in practice. In the CPN demonstrations we use a plastic tube containing a number of dry cell batteries in series.... in other words positive to negative, thus adding up the potential of each. The 'foreign' voltage is the sum of influences caused by man and are in series in the measuring circuit shown in this column. The 'teluric' effect is the voltage coused by the ground being composed of chemicals such as telurite, carbonacious material and organic material that had an impact on the measurement of voltages but no impact on the corrosion reactions on the pipeline. The close potential is the potential of the electrolyte in the zone outside of the IR drop of the reaction EMF. The EMF is the component known in laboratory work as thr IR drop. This is the zone in which it is not possible to make a measurment without the use of a Lugin capillary. The pipeline metal is the conductive metalic block that has so little resistance that it is impossible to measure the electrical flux. 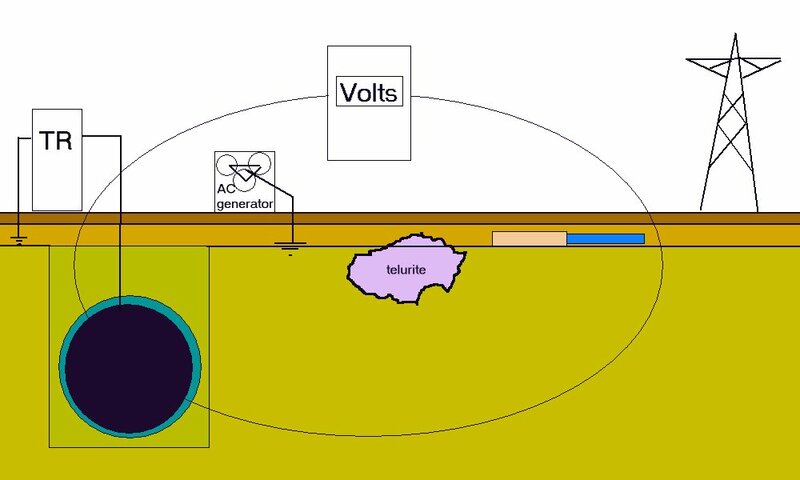 This electrical flux includes all the paths from all the corrosion anodes and cathodes as well as induced currents etc. They reach an equilibrium that we can conveniently name the pipeline metal potential. It can be seen from this drawing we are not capable of measuring the immediate potential as it is in series with other potentials in the measuring circuit. 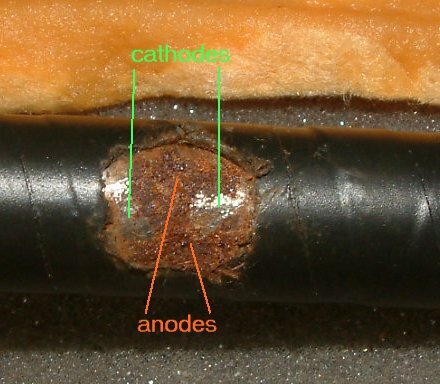 As has been explained, switching off the cathodic protection current only removes some of the electrical flux that is effecting the corrosion status. We need other techniques to provide data that can be applied to the analysis at each location. It can also be seen that the baseline of the traditional graph is not the straight line that is normally depicted as the pipline metal potential can be varying with time. The following is a step by step method of gathering the data required for a standard CIPS survey. Additional procedures are then necessary to enhance this data so that is is useful. A hand held recording multimeter. A crocodile clip for connecting the end of this wire to the pipeline test lead. A banana plug to attach the fixed end of this wire to the meter. A holder to attach the meter or tablet computer to the top of a suitable pole. 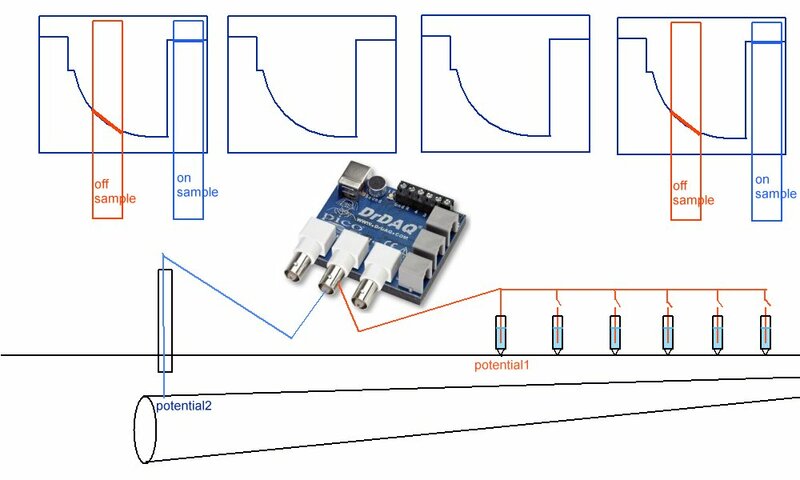 Flexible leads to connect the ground contact probes to each other and alternatively to the meter and other probes. Tripod attachments for the lower section of each pole to allow free standing. A fishing reel arrangement to allow the trailing wire to run freely from the spool. A crimping kit to make field repairs to the trailing wire. A tablet computer/mobile phone/GPS locator/camera. A jacket with sufficient pockets. A ruck sack with small seat, umbrella, spare spools, first aid kit and 'life straw' water filter. A champion Swiss army knife. Bush trimming shears for cutting back shrubs. Boots and snakebite leg guards. Sealable airtight plastic bags for SRB samples etc. Face flannel and cleaning rags. The first 10 KM of the survey should be regarded as the 'mobilisation' section during which time the whole team from labourers through to office management are training and being trained in the disciplines required to execute the work. Land access, traffic control, seasonal conditions, local politics, travelling time, crew accommodation, emergency and contingency activities must be considered and structured. On site method of work. All impressed current transformer rectifiers that influence the subject pipeline should be set to switch off for one second in four. If the timers do not allow this ratio then a smaller time span may be used but it should be understood that this will effect the 'off voltage' measurement, dependent on the total capacitance of the system. The timers should be synchronised through the GPS system to the locator carried by the survey team. The team should locate the groundbeds and carry out a ground potential survey across the groundbed and the pipeline with respect to a Cu/CuSO4 ground contact electrode that will remain in the same position for the whole of the survey. This can be regarded as a reference potential for the whole of this survey and for all voltages measured in relation to this pipeline. It will also be used as the only potential reference for interference testing and where voltages are required in calculations relating to the mitigation of interference from overhead cables and railway traction engines. 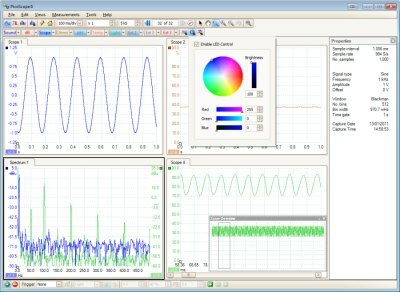 This screenshot of a simple computer programn shows how every potential must be related to all other potentials in order to be meaningful. There is no such thing as zero potential and ALL meters and osciloscopes display VOLTAGE measurments that are the difference between two potentials. We first measure the resistance in the spool of trailing wire. The diameter of the wire is too small for a wire stripper and peeling with a knife sometines severs the copper, so the best way is to gently clean by running the wire through folded emery cloth between the finger and thumb. The cleaned wire should then be tangled with a multi-stranded wire that has been soldered into a crocodile clip. The joint is then wrapped in insulation tape for strength. The end that comes from the centre of the spool should be re-inforced with insulation tape and secured as if it breaks too close to the spool the whole lot will be unusable. 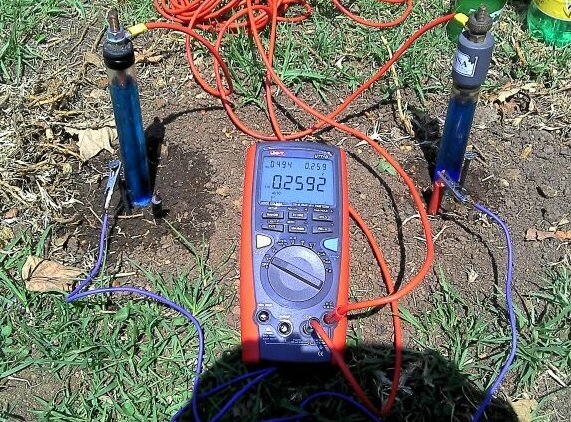 We then connect the crocodile clips to the meter probes and set it to read Ohms and note this in our field book and in the data logger/recording voltmeter. Some brands have the meter in a leather harness that allows the operator hands free use of the walking sticks and some arrangements have the meter mounted on top of one of the walking sticks. 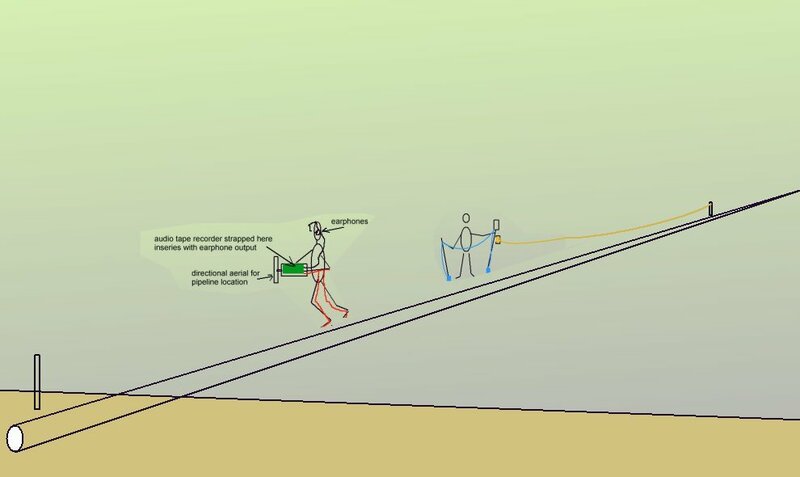 Later equipment has a digital osciloscope in the pocket and a tablet PC/GPS/Mobile phone mounted on one of the walking sticks with the trailing wire spool. 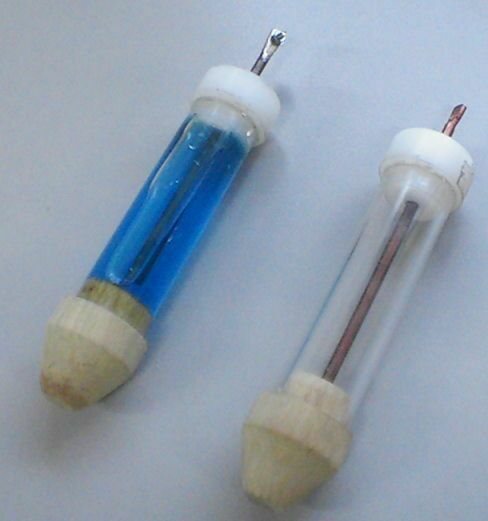 The tips of both walking sticks are put on the ground and the meter is started. 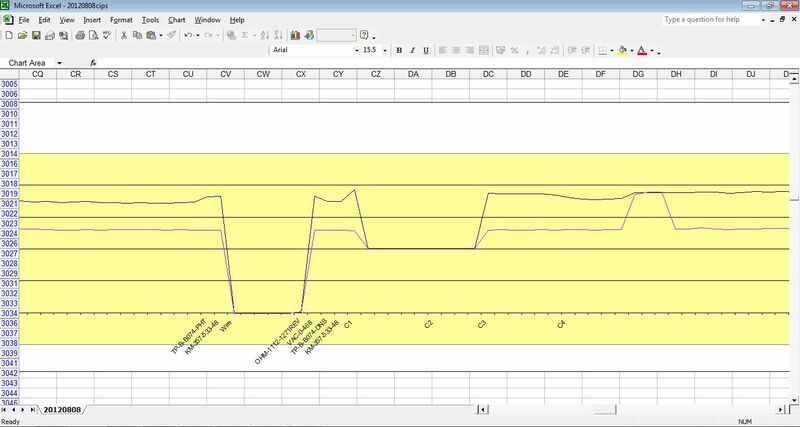 With the CP switching on and off, two graphs are now plotted automatically, giving permanent information which is not dependent on the operator noting the readings. 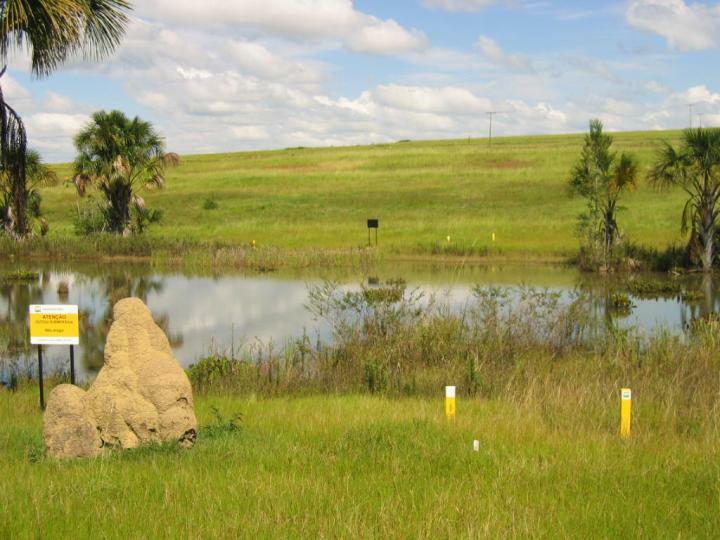 Photographs are taken to show the location of the test station and enough background to view physical features that might indicate electrical ground disturbances. 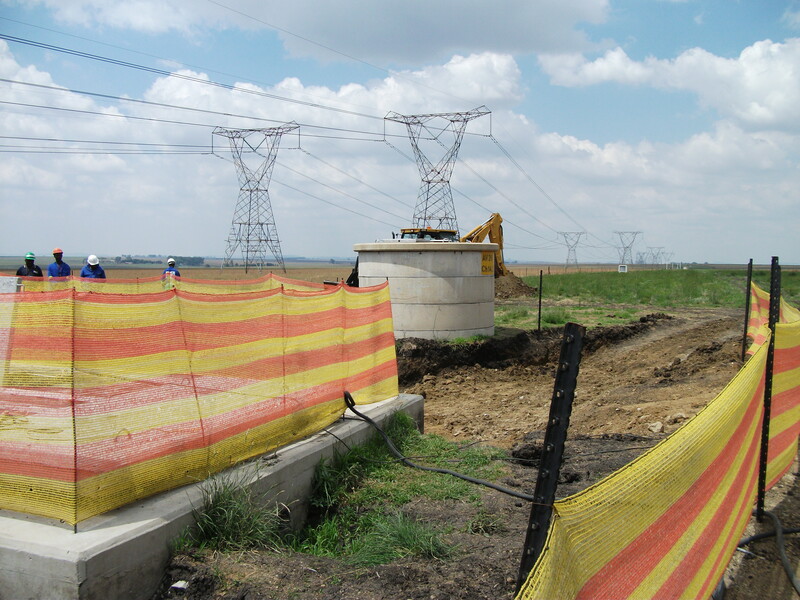 Power sub-stations and industrial generators are typical together with overhead pylons, metal fences, bogs, cattle feeding areas etc. 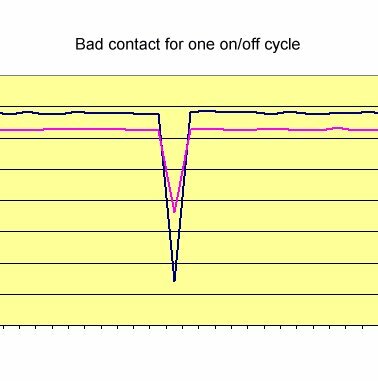 This condition will be seen in the data when the trailing wire is broken and when the probes are stepped over very highly resistant surfaces such as dry concrete. The external resistance of the measuring circuit is greater than the internal resistance of the meter so the charges cannot activate the measuring 'mechanism'. click to return to procedures index page We must now fix the location at which each of these voltage measurements has been made and the data logger records the GPS position for every row. There are normally four columns of location data and these must be placed from the original data onto a spread sheet tgether with the record numbers. The column with the features and site notes should be pasted in such a way that each feature is in the row with it's location data. The visible features can then be located on a satelite map image and the path of the pipeline can be marked.